Last Tuesday, Lithuanian Prime Minister Algirdas Butkevičius demanded that Belarus to not construct a nuclear power plant (NPP) in the vicinity of Lithuanian territory. He referred to the alleged breaking of the Espoo Convention by Belarus. Lithuania claims that Minsk is building potentially dangerous facility in a risky place without properly consulting and informing an exposed Lithuania. The Belarusian opposition and NGOs raise environmental issues and criticised that the power plant is being built by Russians and on a Russian loan. Belarus does not need more energy, and the whole project would bring Minsk closer to Moscow, they claim. Yet Belarus already imports its energy and there are no better options to provide the country with energy. The only reasonable alternative - modernised thermal power plants - make the nation more dependent on Russian oil and gas with their ever increasing prices. 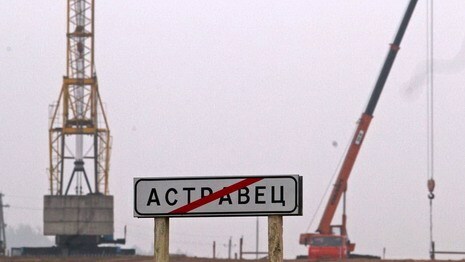 The Belarusian NPP is being constructed in the Astraviets district, a pristine location close to the Lithuanian border. There are only 53 km from the site to the Lithuanian capital, and the river Viliya which flows through Vilnius shall provide water for the NPP. So, Lithuania has reasons to be concerned. On the other hand, the Lithuanian government itself is going to build a new NPP next to a Belarusian National Park and position it close to the second largest Latvian city, Daugavpils. Lithuanian officials emphasise the risky geology of the site. Gitana Grigaityte of Lithuanian Foreign Ministry told the BNS news agency that, “severe earthquakes were registered in the territory in late 1800s and early 1900s.” In 1908, some newspapers published a story from the Astravyets district about an earthquake which, however, was not registered by scientists. In a word, both the story and its pedigree are questionable. As for water, the Astraviets NPP is planned to only take water from the Viliya, but not return it into the river. And the prevailing winds in Astraviets region blow eastward, i.e., onto Belarusian territory. The Belarusian NPP apparently is causing such a reaction by Vilnius not only due to environmental reasons. The construction of the Astravyets plant effectively condemns the plans for building a new NPP in Lithuania to the wastebin. What investor would be willing to putt his money into a Lithuanian NPP, knowing full well that in a few years the whole region is going to have plenty of cheap energy? After all, the Kaliningrad NPP will go online by 2016, and the two reactors of the Belarusian NPP will be going up too – in 2018 and 2020, respectively. [1 – Baltic NPP (Kaliningrad NPP); 2 – Astravets (Belarusian) NPP; 3 – Visaginas NPP; 4,5,6 – three potential localizations (Żarnowiec, Choczewo, Gąski) of the first planned Polish NPP. ] 1 – Baltic NPP (Kaliningrad NPP); 2 – Astravets (Belarusian) NPP; 3 – Visaginas NPP; 4,5,6 – three potential localizations (Żarnowiec, Choczewo, Gąski) of the first planned Polish NPP. It is no wonder that at the prospect of the project of a new NPP in Lithuanian, Visaginas is facing considerable problems. The agreement to this effect has already been signed by the three Baltic republics seven years ago. Although Vilnius has chosen the strategic investor - Japanese Hitachi - so far no investment agreements have been signed. It should also be noted that last autumn a national referendum was held where Lithuanians voted against the construction of the NPP. In May, the Lithuanian prime minister still insisted that his country was not going to renounce its plans for an NPP even if it would not be economically profitable. This decision is not without a good reason - after shutting down its Ignalina NPP, Lithuania became dependent on Russian energy imports. Belarusian opponents of the national NPP have two principal arguments against it. First, the country suffered the most of all countries in the region from the Chernobyl nuclear accident and, second, Belarusians will live better without nuclear facilities. Yet some facts show that, in all likelihood, Belarus cannot afford it. Even now when the energy-consumption in Belarus is lower than in neighbouring countries – 3,300 kWh annually (while in Ukraine 3,900 and in Poland 4,000), in winter as energy consumption rises, the country has to buy additional electricity abroad. To understand the financial benefits of nuclear energy, Belarusians need only to look to their Lithuanian neighbors whose electricity expenses are much lower (almost a third compared to Belarus' present level) until their Ignalina NPP was shut down in 2009. The attractiviness of nuclear energy for Belarusians rises with a rise in the price of gas and oil. Even though as a Russian ally and Belarus them at a lower price, it is important to consider that while in in 2010 one tonne of Russian oil cost USD $284, in the first quarter of this year it costs USD $422. Belarusian energy system relies on a network of rather old facilities. The actual level of energy conversion efficiency in the country is only about 27% for its thermal power plants, and 19% for its heating and power stations. It is possible to raise it to 60%, but to do so Minsk needs a lot of money and time. Renewable energy resources in Belarus are limited to a small number of windpower generators and hydropower plants. And even the two reactors of the Astraviets NPP with the capacity to generate up to 2,400 megawatts together might be not sufficient. To achieve the per capita energy consumption level of, say, Czech Republic, Belarus needs one still another similar plant. Earlier this month, Deputy Energy Minister Mikhail Mikhadzyuk announced that Belarus is willing to consider offers from potential investors eager to build a second nuclear power plant in the country. The second argument against the NPP underlines that to build the Astraviets NPP, Belarus takes loans and becomes increasingly dependant upon Russia. First of all, from Russia it has received around USD $9 billion, yet to build the necessary energy-transmitting lines Lukashenka signed in July another loan agreement with China for almost USD $324 million. Atomstroyexport, a subsidiary company of the Russian Nuclear Energy State Corporation Rosatom, is the prime contractor. The Astraviets NPP, however, is the property of Belarus. It will not be easy for Belarus to repay this sizeable Russian loan. Yet with current trends of increasing energy costs, the NPP looks like a rather promising investment. As for other possible dependencies, they do not lessen Belarus' already critical dependency on Russia. Minsk takes Russian technology and equipment and trains its specialists in Russia in so many areas that one more such area will not change much. In addition, the situation is not nearly clear-cut or fatal as it might seem. As the deputy director of BelNIPI Enerhapram Uladzimir Babrou emphasised at the beginning of the project, even with Russian-designed reactors Belarus would not become dependent on Russian uranium. Minsk had already studied the possibilities of getting the fuel from French and Chinese companies. Moreover, companies like the French Areva and the Japanese-American Westinghouse-Toshiba declared their willingness to supply fuel for the Russian-designed NPP. It will be easier for Belarus to diversify its sources of plutonium rather than natural gas or oil. In today's Belarus, the opposition media and parties discuss every project in terms of policies pursued by Lukashenka's regime and its evil intentions. Meanwhile, the Astraviets NPP seems to have a sound economic basis and the idea itself does not belong to Lukashenka. Serious deliberations about the construction of a NPP in Belarus began decades ago. The now-closed Lithuanian NPP in Ignalina initially was projected to be built on the Belarusian shore of the Drysviaty Lake, and only later landed on the side Lithuanian of the border. And the National Academy of Sciences began to look for a site for the prospective NPP as early as in 1992. The opponents of nuclear power plant recall the Chernobyl tragedy, which led to the contamination of up to a fifth of Belarus' territory with its nuclear fallout. Yet Belarus is already surrounded by three active NPPs – in Smolensk, Chernobyl and Rivne. Moreover, the planned Lithuanian NPP in Visaginas would literally be on the Belarusian border, and Poland plans to build up to three NPP in locations which have not yet been defined in north of their country. Has Minsk Something to Hide? Minsk failed to ensure more public participation in the Astraviets project not because it was hiding something. The Belarusian state regularly functions in this way and, for better or worse, actively witholds information from society. The NPP project itself has not been subejct criticism from IAEA experts, who were regularly involved in its planning since at least 2009. The monitoring of the project's safety has been awarded to a Ukrainian institute. Lithuania itself has little leverage over Belarus. Vilnius cannot even resort to the EU's help and lash out at the “nuclear project of the last dictatorship in Europe”, as it would contradict the usual mild position of Lithuania with regards to the Belarusian question. Belarus is also increasingly important for the Lithuanian economy – the latest illustration of this can be found in the Belarusian national potash company buying a terminal in Lithuanian Klaipeda port. The Lithuanian government has grounded its protests on the Convention on Environmental Impact Assessment in a Transboundary Context (informally called the Espoo Convention). The UN Economic Commission for Europe acts as the Convention's Implementation Committee. In March, the Committee found that Belarus failed to comply in full or in part with six norms of the Convention. The omissions seem to refer to the procedure employed and not safety or technical issues. In particular, the Belarusian government apparently made the decision to build the plant before carrying out the needed environment impact assessment (EIA) and, as always, ignored the requirements to provide public information in full information about the project and do so in a timely manner. Belarusian state officials delayed or simply ignored additional Lithuanian questions which made the consultations a pure formality. In reality, the Belarusians had hardly anything from the international Committee or the Lithuanian side. Minsk preferred to ignore not only some Lithuania's requests, but also a letter from the EU and provided the Committee with documents in Russian without a translation into English. At the same time, it manipulated with the EIA texts and held only nominal public hearing with Lithuanian residents. Isolated from many pan-European projects, the Belarusian state clearly has real problems with educating its bureaucrats on new ways of doing government business, particularly in international context. Projects aimed at training Belarusian public servants would help to overcome this problem. Yet isolating all Belarusian government system - regardless of the involvement of specific organs and persons in carrying out political persecution in Belarus - the West effectively preserves the old system in Belarus. Moreover, this would undermine a future government which would be in charge after the current president leaves.